I really hated being on insulin. It made me feel like a failure, because I knew that it was a result of my poor choices in the past. This was one of my strongest motivators for following a ketogenic diet, I really wanted to stop taking insulin. 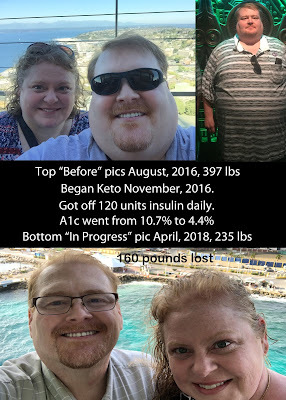 So after about six weeks on keto I decided to talk to my doctor about when and how to reduce my insulin (Lantus which is a long acting insulin). He said that if it helped to motivate me he had no problem in slowly reducing my insulin (2-3 units per day) as long as my blood glucose didn’t go too high. So I decided to start tapering my insulin mid-December 2016. I started by lowering my insulin by 2 units each day. If I felt my blood glucose was going too high, I’d pause for about a week before continuing. Slowly and gradually I was able to keep reducing my daily insulin dosage while keeping my average morning/fasting glucose reading between 150 and 200 mg/dL. That is much higher that I would want to see now, but at the time this was normal. And the good thing was that my blood glucose was stable, even while dropping my insulin. 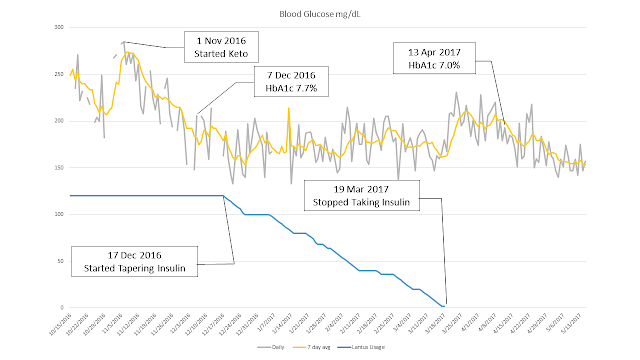 After about three months, in mid-March 2017, I was able to completely stop using insulin. All without much exercise by just eating a ketogenic diet. During this time, I was also able to lose about 30 pounds and was starting to feel more energetic. Now that insulin wasn’t going to pack on the pounds I’d be able to lose weight even more quickly. In April 2017 I had labs taken again and I had managed to drop my HbA1c from 7.7 in December to 7.0 in April. Not earth shattering, but considering I had dropped 120 units of insulin daily in this time I think it was pretty darn good! 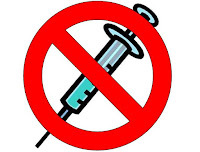 I was still on Bydureon (another injectable diabetes medication) and Metformin (an oral diabetes medication), but I hoped to work on removing Bydureon next. Dropping the insulin lifted a huge weight off my shoulders. It also meant that I wouldn’t have all that insulin increasing my insulin resistance even further. I was still metabolically deranged, but hopefully I could now begin a healing process and improve my overall health. 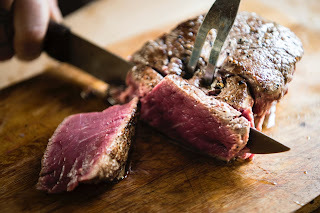 In my next blog post I discuss my newly found appetite for information about the ketogenic diet. You can also read my previous post which discussed how I discovered keto.